The ground, seeded, transforms from dark, dirt black to green growth reaching its pinnacle of dazzling yellow before being harvested. 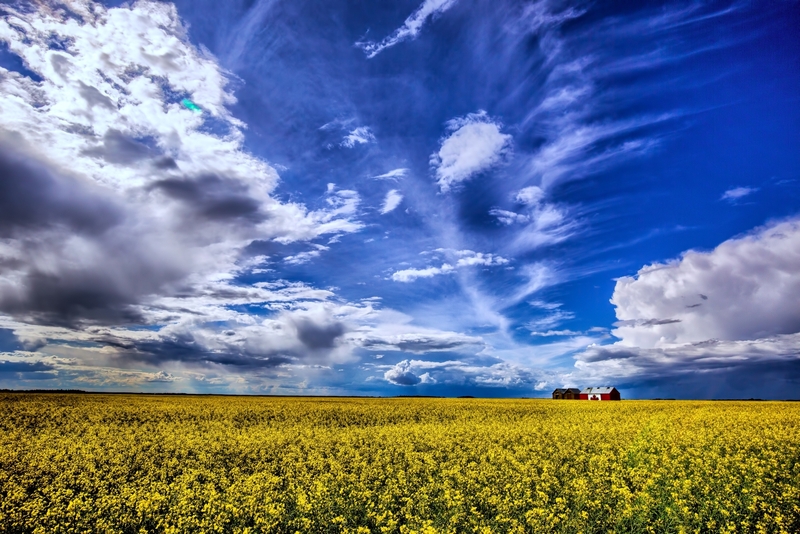 I have driven through some of Alberta’s farmland in the past two weeks and Canola does seem the farmer grown plant of choice, this year, its yellows colouring and brightening what, in winter, had been a darker and more dreary landscape. I had hoped to catch Canola surrounding these Warrensville Westeel grain bins in the past two or three years, never returning to the site/sight until a week ago. The Canada Flag painted on the side of a grain bin forms a landmark for travellers nearing the hamlet of Guy, Alberta. On Alberta highway 2, as you climb from the valley holding the Smoky River going north you’ll find the grain bin on your left two or three minutes along; for many the flag and shed serve as time marker for journeys northward. From this point, I can be at my doorstep in High Level, Alberta in three hours and forty minutes. 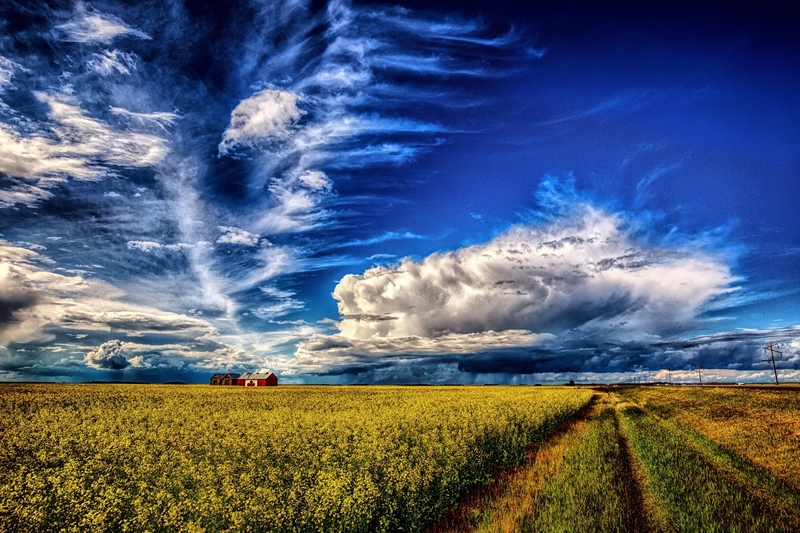 In addition to the broad reach of Canola’s yellows in these images, immensity surrounding the grain bin is also part of things; looking ahead through the miles a cumulonimbus cloud will later offer its weather, wind and rain, as something to be managed within our drive home. These images remind of photographs in which grain fields, mountains and breathtaking cloud work coalesce and immensity is the dominant feature within the image. I hadn’t considered it; but, the fact that a Canadian Flag has been painted on the side of a grain bin holds associations for the farmer – perhaps pride in being Canadian; it may also aim to have others consider the key role grain farmers play in Canada’s economy; or, perhaps the notion has something to do with being in the heart of Canada. What’s also there is perhaps something political … perhaps something like the assertion, ‘we are all Canadians first and foremost.’ The question intrigues – what was the point of origin for the idea of painting a Canadian flag on a farmer’s grain bin? Could you please contact me about permission to use on of your incredible images? Thank you for checking out this blog and for your kind words. 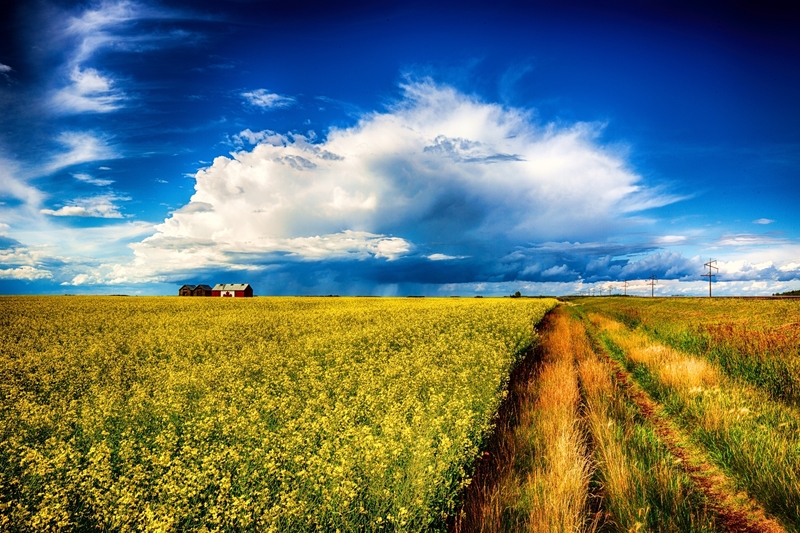 Very mysterious feeling overwhelms when I observe these endless yellow fields, fantastic! Thank you for your kind words and revealing how these images connect with you. Thank you for your photos of Komiza as well. Good, good! LB you have such an eye, your photos are breath-taking!! I have nominated you for the Blogger Recognition Award, here’s the link https://onceuponahotflash.wordpress.com/2015/08/15/blogger-recognition-award/ Congratulations and keep on inspiring us! !